Just like the sunny summer month they were born in, our loved ones with July birthdays are warm, bright and always cheerful. So when their big day comes along, giving them a thoughtful present is the perfect way to show them just how much happiness they bring to our lives. Gifts that are inspired by their birthstone and birth flower make for a truly original and deeply personal gesture. To help you in your search for the perfect way to say “Happy Birthday,” here’s everything you need to know about July birthdays, plus a few unique July birthday gift ideas for that special someone! Each month has its own precious gemstone that is said to bring good fortune and prosperity to those who are born during that time of year. The official birthstone for July is the ruby. It’s no wonder that the ruby is known as “the king of precious stones.” Its deep, royal red hue is believed to have the power to stimulate the senses and bring wealth, success, love and good health to anyone who wears it. Rubies, which were named after the Latin word for “red,” have been admired in China and India for centuries. There, they were used to embellish the armor of soldiers, and they were also buried beneath buildings in order to bring good luck and long life to their foundations. The ruby brings fiery passion for love and life to anyone who possesses it as a birthstone. Show just how deep your love is with a birthday gift that shines with the color of this month’s birthstone. 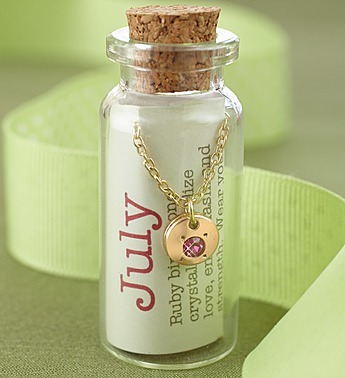 This beautiful vintage-style July Birthstone Bottle Necklace doesn’t just let the birthday girl wear the stunning gem around her neck all year long; it also comes in a whimsical corked bottle filled with a message that explains the meaning of the ruby birthstone. For those with a sweet tooth, give them a sugary birthday wish with Junior’s Happy Birthday Red Velvet Cheesecake. Known as one of the best cheesecakes in the country, it’s decked out in festive layers of luscious ruby red cake and a rich, creamy filling. If your special someone has a green thumb and loves the outdoors, then this Hummingbird Feeder made of hand-blown glass will bring a whole new dimension to their garden with its bright splashes of ruby-like colors. Or, if you’re looking for a birthday gift that’s as fiery and passionate as the July birthstone, the Love Potion flower arrangement is just what you need. Raise a toast the birthday girl with an oversized martini glass filled with intoxicating red roses and more. Cheers! Just like each month is associated with a good luck birthstone, there is also an official birth flower for each month of the year. The blossom associated with July birthdays is the beautiful larkspur. Larkspur is the symbol of spirit, grace and lightheartedness. This flower is often confused with its close relative delphinium, but what differentiates larkspur is its delicate foliage. As long as it’s properly taken care of, cut larkspur can last about five to seven days. To keep them fresh, place the flowers in a vase filled with lukewarm water and flower food. Make sure you re-cut the stems and continue refilling the vase with fresh warm water and flower food every other day. Air-dried larkspur also makes a beautiful addition to wreaths, door swags or potpourri. A gift decorated with the beautiful larkspur blooms is sure to make your loved one’s July birthday sweet and fragrant. Give her a birth flower that she can keep forever: Beautifully engraved with the larkspur, this stylish July Flower of the Month Bracelet is the perfect present for flower and jewelry lovers alike. Or, give her an enchanting arrangement of fresh flowers to hang on her front door. This elegant Lavender Hydrangea Wreath is designed with the delicate and colorful blossoms of not only larkspur, but also caspia, strawflower, fern and more. A beautiful birth flower for a beautiful July birthday girl!